It is truly fitting and proper—somewhat ironic too—that the author of the shortest, sweetest, and perhaps the most useful guide to prayer and union with God was written by a Catholic who never became a saint, never became a priest, and worked almost his entire life in the kitchen.Nicholas Herman grew up amid the violence and upheavals of The Thirty Years War, and, being a poor peasant, he joined the army in order to eat and survive. One winter, while still a soldier, he happened to gaze upon the bare branches of a tree, and he knew in that instant not only that its leaves and its fruits were certain to arrive, in good time, in the coming spring and in the summer, but also that grace would surely bring him to a flowering and a ripeness too. That tree had "flashed upon [his] soul the fact of God" and from that moment he never ceased to burn with Love.After being wounded and discharged from the army, Nicholas first worked briefly as a footman, and then entered the Discalced Carmelite monastery. Considered too unlettered to be a priest and too ignorant to perform any but the most menial tasks, he was assigned to cook and clean in the kitchen. The name he chose for himself was Lawrence, for St. Lawrence was the Patron Saint of Cooks, having achieved his martyrdom by being cooked to death on a grate. (“Turn me over! I'm done on this side!” St. Lawrence cried out to his torturers, and this dark witticism eventually earned him the additional title of Patron Saint of Comedians.) By concentrating on the simple, uncomplicated duties of the kitchen, Brother Lawrence developed his method of prayer. Whether he was picking up a stray straw from a broom or washing a bowl or a plate, he continually sought “to fix [himself] firmly in the presence of God by conversing all the time with Him.” This practice, after years, led him to great peace, a conviction of God's presence, thoughtfulness toward others, and an extraordinary sweetness of manner. He was revered within the monastery, admired without, and eventually the aide of a local bishop arrived to crystallize Brother Lawrence's spiritual teachings by transcribing his conversation, which—along with a few letters of spiritual direction—make up The Practice of the Presence of God.If you can, try to obtain a copy of The Practice which, like this one, also includes the “maxims.” The Practice is a better read, for it conveys clearly the sweet personality of the aging friar, but the maxims are more succinct, and numbered, and thus a more efficient aid to reflection and meditation. SO beautiful. Like a love story. Changes your perspective on life...when we want to be "on the mountaintop" yet we are in the valley...learning to be with God in full wherever we are and whatever we're doing, kneeling before Him. He has such wisdom, this is a book you want to read over and over. The most amazing thing is that this was written around the 17th Century and his words are so applicable today. Fascinating that something like this can be passed down through the ages and arrive, on both our kindles and into our minds, to impact us just as much today and in exactly the same manor as it did then. 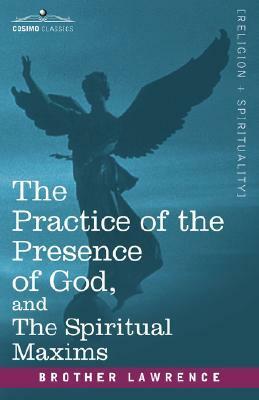 The Practice of the Presence of God is an amazing, impacting book! There are actually two books in here..."The Practice of the Presence of God" and "Spiritual Maxims". Spiritual Maxims is very good, but wasn't very impacting to me. How did "The Practice of the Presence of God" impact me? Well, it basically brought me into a whole new realm...having a continual conversation with God. How that completely changes us...gives us so much joy and peace in whatever circumstances we're facing. The example of Brother Lawrence is just amazing and I have so many quotes from that book that continue to impact me each day. And so I'm starting out on this journey to having a continual conversation and communion with God. It will be extremely difficult I know, but like Brother Lawrence, I hope that in the future it will be harder not to have a continual conversation with Him that to. Definitely recommend this book! Imagining God as the "ground of all being" in the way in which Paul Tillich and others have put forth in their writing speaks to me far more than any idea of a God who brings suffering to people to toughen their faith and strengthen their soul. It must be said that in all likelihood the letters in which Brother Lawrence makes these assertions were written to specific people in circumstances which may have been viewed quite differently in the 1600s. There is much bowing, scraping, and in so doing making oneself worthy in the eyes of God. Brother Lawrence on his deathbed chose to turn to the side of his body which gave him the most pain because he saw it as a means of growing closer to God. That is just a bit too much of the "hair shirt" for me. Too ascetic.Also contained in this book are some simple, even modern-sounding bits of advice for living a prayerful, meditative life. Brother Lawrence worked in the monastery kitchen and turned his labors there into times to draw closer to God through prayer and meditation. Who among us couldn't tailor this practice to one of being more mindful, more present to life's simple moments in which gratitude for the breath of life can be affirmed?For a time, I was a participant in a book group which one of our members named "Neshamah," a word which means the breath of God. We read a wide range of books on spirituality and Christianity; on meditation and prayer. This, for me, didn't measure up to those rich experiences but that doesn't mean it might not resonate more strongly with others. My minister has mentioned this book several times, so I thought I would read it. Actually, I was disappointed. The letters were helpful, but his maxiums? I realize they were written several hundred years ago, but the language was difficult for me to follow. I wanted him to make his point and then go to the next without giving me a lot of explanation. I hate to think our ancestors couldn't understand the point without the wordiness. three stars means i liked it. that sounds about right.it would have been interesting to read his letters and thoughts in context...seemed to have been edited or published with the intent of maximizing it's marketability in today's christian subculture...after i read thomas a kempis, i completely forgot about brother lawrence. but that's no slight to the brother. A short book that packs a lot of punch. Reading this has helped me to see a glimpse of that joy in the Christian life that is promised to us but so few of us actually experience. The practice is fairly simple in and of itself which was a bit surprising but the difficult part is practicing consistently (isn't this always the case?). This was very encouraging - I will be reading it again and again. Why did I wait so long to read this?! Moving, practical, and deep. This is a simple diary like set of reflections on Brother Lawrence's relationship with God. He has very encouraging observations about leading a simple life. All Christians, new and old, should read this book. Period. Insight into the life of a man who made it his life's goal to be in the presence of God moment by moment. His life is admirable, but there is little mention if grace throughout. I revisit this book regularly and I love it, simplicity and humility birthed a man that knew God intimately and knew how to love. I will return to this little book often to remind myself of the simplicity of entering into the Presence of God. An interesting combination in a man who practiced prayer in the ordinary tasks of kitchen work yet believed the key to enjoying God was freedom from the material world, I found in Brother Lawrence's writing a mixture of the inspiring and the absurd. Perhaps this is due in part to my twenty-first century eyes reading a seventeenth century work. There are worthwhile bits - not really any new insights for me, but lots of memorable sayings. I was impressed by Brother Lawrence's love for God. Never fails.This, one of the earliest books I read when I began my journey in the Lord, has remained to me one of the most precious.Having not read it in several years now, and feeling stirred to seek some of those first things, I picked it up again a couple of months ago and have been slowly strolling my way through. Again, Brother L has left my heart well-fed. Every Christian should read this beautiful little work and chew long on its truths. A wonderful book of magnanimous worth and ideally so concise it could be read in a small time, but its implications are eternal: and if read and applied as intended it will change your life! It reminds us of what is important: Loving God. You might be the most famous pastor, or go to the mission fields to give yourself, or go to church and serve there all the days of your life: and yet as Paul said: without love we are nothing! With Brother Lawrence we have an example of a man after God's own heart, and what it entails to live such a life. We have testimony of the great Providence of God showing His favour to the meek and humble (although Lawrence was not declared a saint, or even ever made a priest) through this little book which hasn't lost its worth and brings fruit in the most beautiful of ways even today.I'm going to quote the book:"He complains much of our blindness, and cries often that we are to be pitied who content ourselves with so little. God, saith he, has infinite treasure to bestow, and we take up with a little sensible devotion, which passes in a moment. "This book is here to remedy that blindness! This was loaned to me in high school by a youth leader at my church. I have now located where I stashed my own copy :) It's been a while since I read it, but I can tell you that it has some very meaningful and helpful thoughts/observations/suggestions on prayer. BTW, the Amazon/publisher's/whatever's description of this book is a bit over-the-top, a bit sensational. It IS a good book, but the blurb makes me a little sea-sick. This is one of those books that I believe has a lot more depth than can be found on first passing. Whenever the question of "how do you live glorifying God day-in and day-out?" is asked, this will be the book that I turn to. Personally, I found "The Character of Brother Lawrence" the most insightful portion of the book. This was a good book. Very short. But that's not the reason why it was good. In the quest to learn about prayer, I think it's good to be exposed to many different "styles" and approaches to prayer, including this one by Brother Lawrence. This book changed my view of spiritual connection. 4 1/2 stars. A classic that still yields insights, 350 years after its publication. Excellent book! It's a small, quick read, but it contains so much wealth.